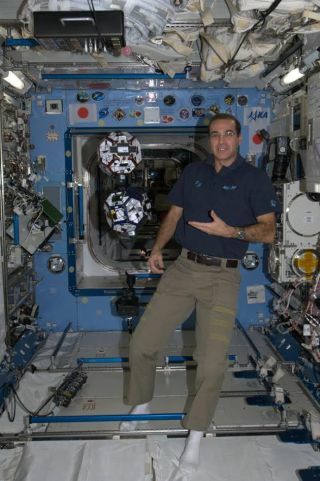 NASA Astronaut Rick Mastracchio tweeted this photo of himself with the SPHERES experiment aboard the International Space Station on Dec. 11, 2013. The experiment consists of small satellites that operate inside the ISS to test various control algorithms. Veteran NASA astronaut Rick Mastracchio is hard at work on the International Space Station, but on Friday (Dec. 13), he will speak with SPACE.com about life in orbit and we want to hear your questions. Mastracchio will speak with SPACE.com at 9:50 a.m. EST (1450 GMT) about his Expedition 38 mission to the space station. You can be sure I'll be asking about the current space station cooling system problem NASA is troubleshooting right now, as well as the upcoming launch of Orbital Sciences' Cygnus cargo ship to the orbiting lab and what it may be like to spend Christmas in space. Rick Mastracchio, 53, is a native of Waterbury, Conn., and holds degrees in electrical engineering and physical science. He joined NASA in 1987 as an engineer and was selected for astronaut training in 1996. During his first three spaceflights— all on NASA space shuttles visiting the station between 2000 and 2010 — Mastracchio logged nearly 40 days in space and performed six spacewalks. For this latest mission, Mastracchio launched to the space station on Nov. 6 on a Russian Soyuz spacecraft. He will live and work in orbit until May 2014 as a flight engineer on the space station's Expedition 38 and 39 crews. This mission is Mastracchio's fourth spaceflight, but first long-duration mission. So what would YOU ask Rick Mastracchio about? Let us know in the comments below.